View a beautiful detail of the 'Ducatus Sleswicum sive Iutia Australis' -map of Johannes Blaeu, showing the flooded isle of Nortstrandt. Map was published in 1662, but was a remake of a map published by Johannes Meyer and Caspar Danckwerth in 1652 . For those who are not aware of the location of Nordstrand and Husum, we will make a trip through the region where the flood of 1634 occurred. First we have to eliminate a misunderstanding about the adjective “Frisian.” If we use the word Frisian, we are not only referring to the Dutch province of Friesland, but also to a long chain of islands extending from the Netherlands, northward past the German coastline, and along the southern part of Denmark’s coast. The islands north of The Netherlands are called the West Frisian Islands. The top of the mainland, north of Amsterdam, is called West Friesland. The Province of Friesland is at the other side of the dike, which connects the two parts, left of the word Groningen. 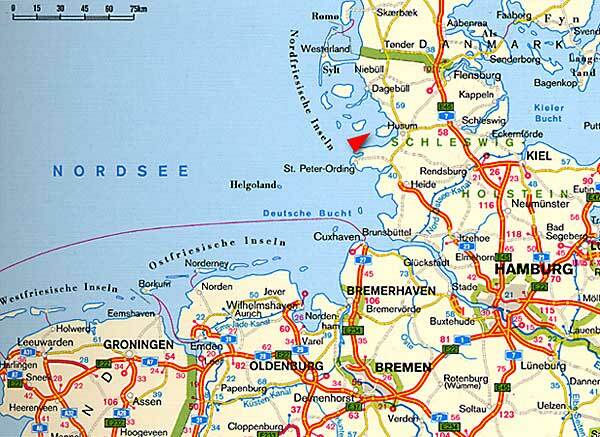 The area in Germany where you can read the name Wilhelmshaven (on the map) is called East Friesland, and the islands are called East Frisian Islands. If we move north to the Danish border we come to the North Frisian region. The islands along this coast are called the North Frisian Islands. One of those is Nordstrand. You can find the island right of the red arrow. Now go to the following my by clicking here. These are recent maps and you can see that the island of Nordstrand (which is now a peninsula) is situated in front of the town of Husum. The disaster area extended from the Danish border until about 20 miles south of Husum. The storm and flood had its effect on a far larger scale, but not as devastating as in the area mentioned above. It’s good to mention that, from 1460 until 1864, the North Frisian area was part of Denmark. The Duchies of Schleswig and Holstein, including the North Frisian islands, were ruled by Danish Dukes, members of the Royal Family of Denmark. During the night of October 11-12, 1634, a raging storm destroyed the coastline of North Friesland. In a few hours, the flood accompanying this storm, swept away complete villages, hamlets and even islands from the face of the earth. About 15,000 people lost their lives that disastrous night ,a pivotal event in human history within this region and beyond. Nordstrand Island - where more than 6,000 people drowned- suffered the most devastation. The tremendous power of the water destroyed about 50 miles of the coast between Nordstrand Island and the Danish border. At Eiderstedt, the area south of Nordstrand Island, 2,106 people drowned, despite being protected by dikes 18-20 feet high. Inside Klixbüll's church, people marked the water level on the wall: 14 feet above ground level. This was the second great flood in the history of the North Frisian region. In 1362, a similar flood, known as the “Grote Manndränke”, ravaged the same area, but little is known about that disaster. The early years of the 17th century had not been easy on the inhabitants, either. In 1603, bubonic plague diminished the population of the whole area; and, in 1618, the Thirty Years War brought hunger and poverty to the region. In 1630, the government hired Dutchman Jan Adriaansz Leeghwater to supervise a land-reclamation project. The 1634 flood wiped out four years' hard labor of his workers in a few hours, breaking existing dikes in hundreds of places or completely washing them away. As the water withdrew from the fields, the salt stayed behind and made the fields useless. The results of the flood were disastrous for the economy of the entire North Frisian coast. All these aspects and the traumatic experiences of the flood paralyzed the spirit of enterprise of most survivors. Many moved away, a large number of them to Holland. The flood had a devastating effect on the island “Nordstrand,” which suffered most. The island, which was sometimes just called “Strand”, was about one hundred square miles in size, had less than 8,500 inhabitants and was situated in front of the town Husum on the mainland of Schleswig-Holstein. The sea swallowed more than half of the island. A total of 6,123 people drowned, and 1,339 farms and houses were washed away, as were 28 windmills and 6 clock towers. The estimated loss of livestock was 50,000. Some of the destroyed villages could still be reached, and people did everything to save items from the churches. Even in this disaster area the holy places were not safe for plunderers and thieves. The bills of carpenters and other workmen show us that even in 1640 the region was still not over this tragedy. Accounts tell us about repairs, but also about the demolition of churches; church-chairs, stones, beams and church-doors were sold. Some inhabitants rebuilt their houses on self-made hills of peat and mud, trying to survive the tides. But most of the island was doomed. As long as the dikes weren’t repaired, the lower parts of the island were a plaything for the sea. Seven years earlier in 1627, the Danish ruler of the Nordstrand Island, Frederick III, Duke of Schleswig-Holstein-Gottorp, had lost a battle against the German troops of Emperor Friedrich II at Lutter during the Thirty Years War. As soon as he found out some of his enemies had settled on Nordstrand Island, he traveled there; but the islanders rebelled against their Duke, and he had to withdraw. While retreating, he spat out these prophetic words: “With God’s Help, this island should sink into the sea.” Thus, when the islanders pleaded for his help after the flood, Frederick III refused, saying, “God is just. My wish has come true”. Over the intervening years, the sea continued to reclaim most of the island. Only three parts remain--the eastern part of the island, still called Nordstrand Island, the most westerly part where the village Pellworm gave its name to the new island and the small Nordstrandischmoor. In October 1634, the Dutch hydraulic engineer Jan Adriaansz Leeghwater lived near the village Dagebüll, a few miles north of Husum. He was working on a land-reclamation project nearby and was an eyewitness to the terrible flood. On the day before All Saint’s in the year 1634, when I was working as an engineer and a surveyor in the Bottschloter project, a big southwesterly storm came from the sea. At seven or eight in the evening, I visited the house of master carpenter Pieter Jansz, who was from Friesland, and who worked on a big new sluice in the project I was supervising. Pieter Jansz lived there with his wife and children, and while we had a lively conversation, about 10 to 12 persons were present. As the wind became stronger, I suggested I’d better go home, which was not far. Pieter Jansz said to me, 'Master, why don’t you stay in our house tonight?' I asked him, 'Where should I sleep?' He answered, 'On the floor.' 'No, Pieter Jansz, what if the water rises. Your house is only five to six feet above ground level. Mine is on the dike, at least at 11 feet.' So I headed for my own house. I stopped for a short while at the house of Pauwels Harmensz to warm myself. He arranged that one of his men accompanied me to my home. When I arrived at my house, where my son Adriaan was waiting for me, we went to bed with our clothes on. The wind, coming from the west, became so strong, that we could not sleep. As we were lying on our beds for about one hour, my son said, 'Father, I feel water dripping in my face.' The waves from the sea smashed against the dike onto the roof of the house. It was a terrifying sound. "Shortly after this, Supervisor Siewert Meynerts came along. He knocked on the door and shouted, 'Leeghwater, it’s time to get up!' My son and I collected our things and went to the mansion, which was not far from our home. Siewert Meynerts said, 'I will be glad if we reach the mansion alive.' All the planks and slats were blown from the stockpiles and were flying around. Finally we reached the mansion safe and sound. The water was now almost at the top of the dike. Apart from the dike reeve, his family and personnel, who were about 18 persons, some 20 refugees had found shelter in the mansion. The wind turned a little to the northwest and was pounding against the house. I had never experienced anything like it. A strong door at the west side of the house was smashed by a wave and the water came into the house. The fire was extinguished by the water, which came so high into the room, that my boots were instantly filled with seawater. A carpenter took an axe and made a hole in the lower part of the wall, so the water could run off. The water was now at least 13 feet above ground level and came into the room in waves. For at least three hours the storm went on. It was impossible to see if the water was rising or dropping. At the northern side of the house the water had washed away the soil around the walls. A gutter of six feet deep and 10 feet wide undermined the walls and floors. The house started falling apart. A money box, filled with money and jewelry, was swallowed by the earth. The mansion was almost washed from its place. Next morning, we saw and heard that all 37 houses of the workers were washed away, including all the people therein. Dikes, which had held up for more than 100 years, were destroyed. That day I took a boat and sailed to the village Dagebüll. The priest told me that the water had reached the level of almost five feet within the church, where people had found shelter. The house of master carpenter Pieter Jansz and the house of Pauwels Harmensz, where I had been before the storm, were vanished. Pieter Jansz and his wife and children had drowned, as had Pauwels Harmensz and his servant, who had accompanied me to my house. And there is more: early in the morning, my house was washed from the dike. The mansion was severely damaged, the cellar was like a ruin, and all the wine and beer had washed away. Big sea ships were stranded on high dikes, as I have seen myself. Several ships were stranded in the higher streets of Husum. I’ve been on the beaches, where I have seen horrible things. Countless dead bodies of people and animals, along with beams of houses, smashed wagons and lots of wood, straw and rubbish. It was like the Flood had been here. In the northern part of Nordstrand Island, dikes were never rebuilt. Pellworm Island and the remaining part of Nordstrand Island got their new dikes step by step. Duke Frederick III wanted strong dikes; he needed craftsmanship and money, so he hired the Dutch to do the job. The Dutch dike builder, Quirinus Indervelde, had the craftsmanship, and his Dutch shareholders had the funds. They were hired to regain the land; and, as a reward, they were allowed to own it. The Duke gave the shareholders the right to rule the island, and to control the jurisdiction and the police. They were also allowed to practice the Roman Catholic religion within the Lutheran Schleswig-Holstein area. Indervelde had to hire hundreds of Dutch dike workers from Brabant, the southern part of the Republic. The Nordstranders did not want to help, because they knew the Dutch would own the land once it was reclaimed. Twenty years after the flood, in 1654, the dikes around the first polder (reclaimed land), Alterkoog, were finished. In 1657 and 1663, the polders Osterkoog and Trindermarschkoog followed. The family grave of the Indervelde family is in a small Catholic church in Odenbüll, built in 1662. The last member of the Indervelde family, Quirinus Fransiscus Indervelde, left the island due to a religious conflict. The Catholic Church on the Nordstrand Island was under the jurisdiction of the archbishopric of Utrecht. In 1723 the Old Catholics turned their back to the Mother Church because the Pope had excommunicated the new archbishop of Utrecht and all his priests. This conflict split up the Dutch community on Nordstrand Island, too. The majority, the Old Catholics, claimed the small church as their own. In order to win back power, Quirinus Fransiscus started a new land-reclamation project, but it failed. The dikes of Christiaanskoog were of bad quality and did not survive the first storm. Indervelde went broke and left the island without a trace. Most of the Dutch investors and dike builders stayed on Nordstrand Island and, until 1870, the sermons in the Old Catholic church were delivered in Dutch. Even today, the archbishopric of Utrecht owns about 100 acres of land on the island. 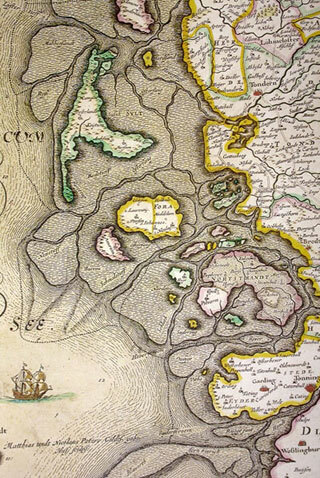 Land reclamations, performed by the Dutch and Flamands did not only take place at the Nordstrand Isle but also in Eidersted and the Stapelholm area as in all the regions and spots you can trace at the map on the left. Dutch knowledge and expertise at the field of land reclamation wasn't limited to this area though: the Fens in England also are widely known. There are, however, much more places where the Dutch were active. Dutch/Flemish hydraulic engineers-and their families- have been active in Europe mainly from the 16th- up till the 18th century. Click here to see the places all over Europe where the Dutch and Flamands have been active in the field of land reclamation.